I recently was introduced to Malia Dell’s new cookbook, Food That Works, and instantly wanted all of my clients to pick up a copy for themselves. My clients are busy, career-oriented people who also want to be healthy. They don’t always feel they have the time, energy or resources to lead the healthy life they want. Food That Works can help them do that with grocery lists, tips on how to reduce waste and humor. Malia Dell gives even the most trepidatious home cook courage that they can make healthy, whole-foods meals. I often tell my clients to make a meal plan for the week and set aside a couple of hours on a less busy day to prep for that meal plan. Solid advice on my part, but often my clients would have a difficult time putting it into action because it was too open-ended. They need the plan given to them, the lists made, and a day to do the prep work decided for them. These are very busy people and the extra planning just wasn’t fitting into their schedule. Food That Works to the rescue. Malia has done the planning and organizing for you, all YOU have to do is buy the book and follow along. Malia was kind enough to respond to some questions that I sent her by email. These questions are all based on my experiences with my clients over the years, comments they have made, questions they have asked, and Malia does a wonderful job of making anyone feel they can cook healthy meals no matter their skill or time limitations. My questions are in bold type and Malia’s answers are in blue. I am a very busy person, busier than the average person. Can this cookbook still help me? Yes. This book was designed for YOU! We all only have 24 hours in a day. But the way we fuel ourselves within those 24 hours can make all the difference in our output and our happiness. With demanding schedules, commutes, and family obligations, the quality of the food we feed ourselves 3 times a day tends to get pushed to the bottom of the priority list. We settle for meals out made with subpar ingredients or processed foods – a lot. By simply fueling our bodies better with homemade, whole foods we can increase our productivity, energy and stamina to keep up with the many demands in our work and personal lives. And hey, we might actually enjoy them along the way! Although my book can’t give you more hours in a day, it CAN give you a simple plan to make whole foods quick and accessible during the hectic week. You work hard, you deserve THE BEST. You have to make yourself and your meals a priority and my book shows you how. I don’t have a local health food store; can I find these ingredients in a regular grocery store? Yes. All of the ingredients in Food That Works shopping lists were carefully chosen based on a “one-stop-food-shop” at a regular grocery store. We are busy. Not all of us are going to make two stops to get our food shopping done, and some of us do not have the luxury of a near-by local health food store. I believe there is a plethora of healthful, quality ingredients that can be purchased in our regular grocery stores, but you need to read your labels! Because of the way food is commercially grown and processed in America, it is imperative to educate ourselves about what is in/on our foods so we can make choices at the store that contribute to our long term health. Food That Works is a companion to be taken to the store to help people do just that. Improve their food knowledge and get in the habit of reading ingredient labels first and foremost to make sure we are buying the BEST quality available, with the least amount of processing, pesticides, and added preservatives and sugars. I don’t like to cook, and I am not very good at it. Why is this cookbook different? This cookbook is different because it was written by someone who for her entire life said those same words. Me! I did not eat healthy, I did not know how to cook and I made it well known that I never had any interest in learning. But once I began cooking for myself, eating homemade food, and taking my meals with me to work, I realized an undeniable shift in my health and I will never go back. I had more energy (who doesn’t want more of that?!!!) my skin was clear, I slept better, my memory improved, and hey, side perk, my clothes fit better! I understand where you are coming from as we certainly shared some of the same hang ups. The whole process around cooking feels daunting, intimidating and kind of embarrassing at first, and that is why I made it my mission to break down those barriers in Food That Works. I walk you through it from what to buy at the store, to how to chop and prepare it, to how to cook it simply and then how to use up its leftovers. This guide is funny and casual and will have you laughing if nothing else. I want people to see that you don’t need to be classically trained to feed yourself well. I am completely self-taught. From one non-cook to another, I know you can do this! Do I have to follow your meal plans? No. You don’t have to, but I believe my meal plans will save you a lot of time! I understand that it may seem strange at first to shop from someone else’s shopping list or a pre-generated menu. But having a plan is the only way to save you money, time, and prevent food waste. I recommend following a week from Food That Works, then after that you will have many ideas of how to improve it, build upon it, modify it, and go off on your own adding your own flare and variations. The ingredients are yours to use up however YOU LIKE. My recipes are mere guidelines to give you ideas. The prep work is the most crucial part in order to eat healthy on the fly. My Shopping Lists and Prep Day instructions help to get you through it in the most efficient way. Yes. Food That Works is all about substitutions! Make it work for you! They are your groceries. If you get through your prep work, chop everything up, then end up making omelets with it for every meal this week, then go for it! Just use it up! It matters not to me how you do it, just that you are in there in your own kitchen banging around, connecting with your food and having fun. I can’t say that I EVER cook my own recipes the same twice! I always add new things and experiment. It’s more fun that way! I figure if I add ingredients I like, then it will taste good to me. Actually ingredient substitutions, was actually how the concept of Food That Works was born. I would take a meal I loved, or often ordered out, and then think, “Hmm…how can I make that myself and healthier? For example, Fettuccini Alfredo, buffalo chicken salad, lasagna or cookies. These foods aren’t exactly the healthiest foods right? WRONG! If you learn to make them yourself you get to control the ingredients and modify them to be better tasting (just the way you like them), AND better for you! Go forth and substitute! Let me know how it turns out! Is this a vegetarian cookbook? No. Food That Works is not vegetarian, but it does not have that many meat dishes. You can easily omit the meat to make them vegetarian. For example, Turkey Tacos I suggest you use a can of black beans instead of ground turkey meat for an easy vegetarian option. 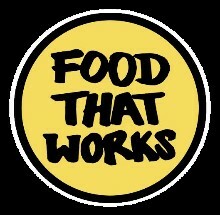 I would love to do a Food That Works II, Vegetarian with meat option! To reverse the roles a little bit! Does your cookbook include desserts? Yes. Food That Works has several desserts. Cookies, brownies, yogurt bowls, smoothies. C’mon, I am human! We all need treats once in a while. My philosophy is you can eat anything you want; you just have to make it yourself. Taking the time to make and bake homemade cookies is delightful, but you probably wouldn’t go through that process every day, so it limits you right? That is why baking them yourself is very different than just tearing open a bag of cookies that you grabbed off a shelf. Look at all the junk that is added to packaged cookies. and how long ago where they actually made? Nothing beats the fresh version. You got this. How did you come up with this concept and develop the meal plans? The idea for Food That Works came to me because it is what I needed in a cookbook and I could not find it. Other cookbooks, although lovely, focused on one beautiful meal, then left you there. I needed something to help me survive Monday through Friday. I just wanted a simple, realistic plan so I didn’t have to recreate the wheel each week at the grocery store. A plan where the ingredients I bought crossed over into other recipes so I wasn’t left with random leftover ingredients that were costly and went to waste. I quickly realized that the only way to prepare homemade meals on the fly during the week was I needed a plan, prepared whole foods, quick meal ideas to choose from, and it needed to be minimal clean up. Because on a Wednesday night when I get home late I am not going to get the cutting board out and make a big production, let’s just be honest, it’s not happening. I don’t like it when I have to buy a bunch of vegetables and herbs and then end up throwing half of them away, how can I avoid this? You need a plan! It is easy to go into the grocery store without a plan, all laddy- daa, throw a bunch of random ingredients in my shopping cart, with total good intentions to cook them. Right? That right there is setting you up to fail. It is extremely difficult to come up with meals during the week from a bunch of random items we bought! That is when we resort to the take out menu drawer and all our good intentions and beautiful food goes to waste. Food That Works has already done all that sweet math and planning for you. Every ingredient you buy for that Week gets utilized so there is NO WASTE. If you know multiple meals and ways in which you can use up those fresh herbs then you will absolutely use them before they go bad! Try shopping and cooking a few Weeks from Food That Works and you will become a pro at the art of using crossover ingredients. You will quickly see how a little forethought and prep work will save you hours during the week, and save you money and save your health! Purchase your copy of Food That Works at Malia’s Websites, today!